Turn2us’ research also suggests a lack of awareness of the help that could be available to low income working households or potential reluctance to access it. Of those who are struggling to pay their energy costs, only 12% have told their energy supplier about their situation and only 5% have turned to an advice organisation for help. Three-quarters have not checked their eligibility for welfare benefits in the last twelve months, whilst a huge 83% are unaware that some energy suppliers have charitable trusts set up to help certain customers. “Our research paints a startling picture, revealing the extent to which households are struggling to heat their homes, even though they’re in work. It is clear that more needs to be done to help raise awareness of the financial support and other help available to people on low incomes to help them manage their energy costs. The new findings from Turn2us are released on the same day that The Trussell Trust releases its latest figures showing that numbers helped by foodbanks nationwide are still at record levels - and that winter is likely to see a further spike in need. 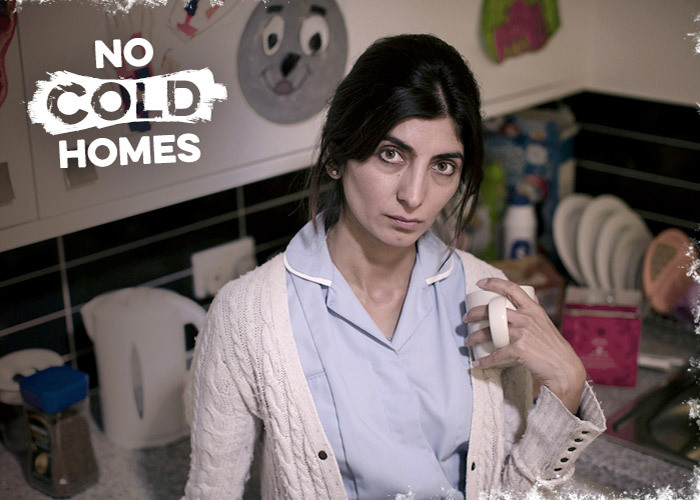 The No Cold Homes campaign runs from 18 November to 16 December 2015. As part of the campaign, Turn2us is hosting an online celebrity clothes auction (30 November – 10 December) to raise awareness of people’s struggles to heat their homes and funds to help more people affected. Emma Lamberton, Communications Manager or call 0208 834 9259. All figures, unless otherwise stated are from a survey conducted with Research Now in September 2015. Total sample size was 2,001 adults with annual household incomes of £30,000 and less before tax and deductions.